On September 23, 2005, Magnificent Desolation: Walking on the Moon in 3D released on giant IMAX screens. 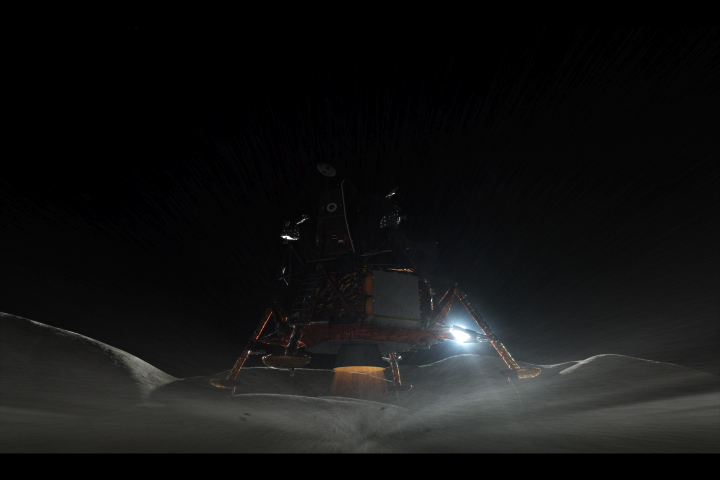 It is a 4K stereo3D experience of the Moon landings, and speculative missions from the past and future. The film was honored with the first Visual Effects: Special Venue award by the Visual Effects Society in 2006. 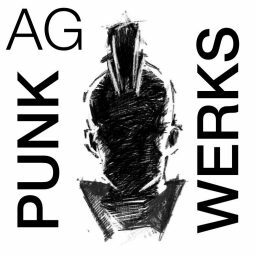 This multi-part article is based on a presentation about the visual effects at LA SIGGRAPH, the following June, however this article is an expansion of that text to emphasize an aspect that is unique to the production. I am an avid revealer of the obviousness of the visual and historical proof of the Moon Landings and the easily disproved Hoax points, which I spent over an hour slaughtering on film for the Fox show – they used one 10 second clip. 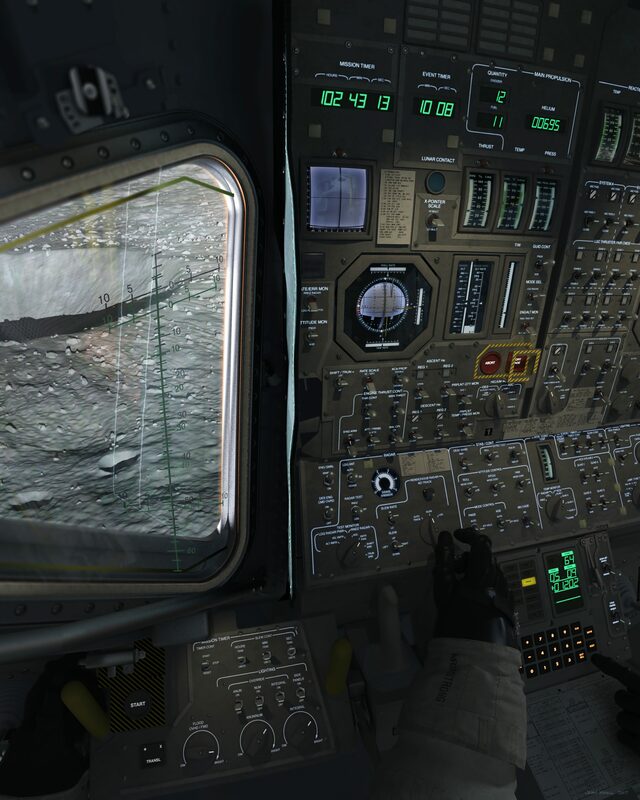 I can’t prove the reality of the landings by doing the simulation, but I can revel in the data set and what it proved of the genius and quality of engineering that got us there. Interaction with the entertainment industry is often tainted by an entertaining, though occasionally false premise. The producers of Magnificent Desolation wanted to do the opposite, and their funding allowed some real science to take place. 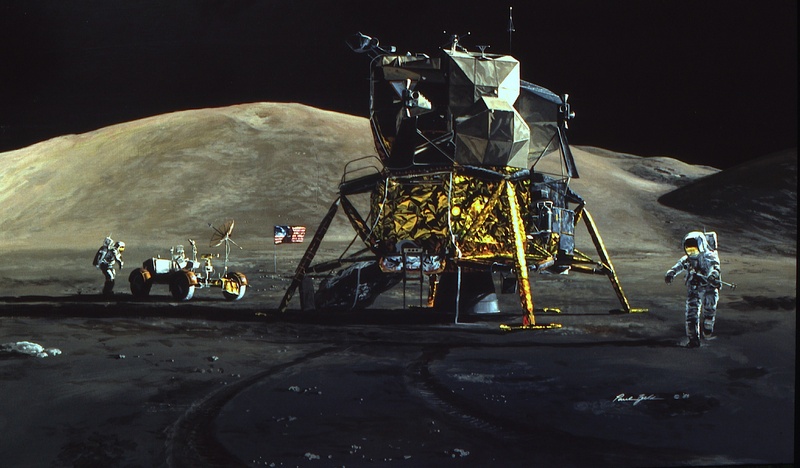 The use of simulation in Magnificent Desolation is another step toward science and entertainment melding together in an “archeological dig” through NASA history. What follows is a “slice of time” during the production of the visual effects, where all the problems were not solved. It displays the evolution of the simulation, and the constant re-analysis of the data to find the result. Not only does the simulation create visuals for the IMAX screen, it may also reveal the challenges the Astronauts faced in real-time, and their impact on future planetary missions. This article is extracted from email interviews with the creator of the Magnificent Desolation flight simulator, and contains many terms understood by rocket scientists. Little effort is made to “dumb this down” as the tool is a specific scientific instrument applied to visual effects. “So I tried the P64, Approach Phase data set. It was worse. I began to suspect my own (now more than 10yr old [in 2005]) code, and began stripping away and working up, from first principles, the formulae for everything, including attitude. I pushed the data sets through this new, “better” and confirmed correct code, but the generated trajectory still had that big left hook instead of a right one. If you want to play with the controls of a Lunar Module, someone more recently has built an online simulator as a toy (this is not Fjeld). Here is a video of that modern software in action, it is also inspired by the fantastic accomplishment of so long ago, but is not from the IMAX film, but you can compare it to the test renders above (it seems that they may have seen the film and rotate their camera to rebuild those shots). If only the data used for this high-quality toy were available in 2005! This concludes the coverage on Magnificent Desolation. The Astronauts who went on location for us. Shoot I almost didn’t come because I thought it was a real nutball moon landing hoax site! Glad I did, that interior shot of the LM instrument panel in the dark is glorious! Thanks!